Falk argues from his personal journey as a biologist and professing evangelical Christian that only science, not Scripture, can reveal the details of creation. Evangelical Christians must therefore reinterpret Genesis to be consistent with long-age theistic evolution. There is nothing new in this book, yet Falk writes as if he is breaking new ground—he appears to have not researched the field! Fundamental errors, omissions and contradictions confound the book’s message to the point that one has to question the competence not only of the author but also the publisher. Such comprehensive ignorance on an issue so important to the Christian faith is inexcusable. If you wanted a respectable-looking, easy-to-read reference to justify your belief in theistic evolution then this book could be it. The author is a long-time and respected Professor of Biology at an ostensibly Christian university, the publisher is well known and has a stable of similarly orientated books, the Foreword is by the Director of the US National Human Genome Research Institute, there are plaudits on the back cover from respected academics, and the book has five-star ratings on Amazon.com. However, the respectability is only superficial. The author’s understanding of the Bible, theology, philosophy, science (he claims to be an expert in science) and the subject of origins is abysmal and the result is self-contradictory. At no point does he engage with published criticisms of his position, so he writes in an uncritical vacuum of his own making. The result is bad science and bad theology. He thus presumes to contribute a complementary view of creation to the YEC position without having researched the subject! Falk writes as if he is breaking new ground, but it has all been said before. On the one occasion that he does address two critiques of his position (p. 199), he does it as if in response to spoken comments from his students, not from any published literature that he has read. He quotes three young-earth creationist (YEC) authors (Morris, Gish and Whitcomb) but only to make points in his own arguments, and at no stage does he attempt to address published YEC critiques of compromise positions, including his own. He thus presumes to contribute a complementary view of creation to the YEC position without having researched the subject! His stated aim is to build a bridge between six-day recent creation and long-age evolution by using Scripture (pp. 14,16). But by ‘building a scriptural bridge’ he means reinterpreting six-day recent creation to fit what he considers ‘overwhelming scientific data supporting evolution and an old earth’. Thus, from the very outset, he is self-deceived about his aims and achievements in the book. One feature that gives the book popular appeal is that it relates Falk’s personal journey (Ch. 1). He grew up in a church that taught a literal Genesis, but his parents and teachers were not equipped to answer his questions about apparent contradictions between the Bible and the real world. He drifted away from Christianity, discovered a vocation in biology (with a Ph.D. in genetics, he teaches biology at Point Loma Nazarene University, California) and came back to Christian faith but with a long age point of view. He argues that Galileo and Kepler, both Bible-believing Christians (among others), insisted that Scripture never errs, but interpreters do, so ‘literalists’ beware! In chapter 2, he deals airily with the text of Genesis 1–3. He argues elsewhere that only scientists can give the complete story of origins, for the Bible only gives us ‘a little more than one page’ on the details of creation (p. 42), and that is couched in ‘baby talk’ (p. 31). The centrepiece of his argument (Ch. 3) is that the ‘data of science’ demand a very old Earth and universe; therefore Scripture must be adjusted to fit. He cites isotopes, tree rings, lake sediments, ice cores, Hubble’s red shifts and the time of light travel to the furthest galaxies, all to show that the earth and the universe are far older than a literal Genesis will allow. ‘When scientists look at this data without the lens of faith, they propose, given the atmospheric conditions and the composition of the earth, that the origin of life is a highly probable natural event. As Christians, we believe that although it was indeed a highly probable event, its high probability relates to the fact that it was responding to God’s command and God’s Presence [emphases added]’ (p. 89). Falk refers to Ambulocetus (literally ‘walking whale’) as a whale ancestor. 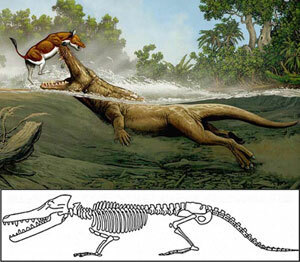 But this recent skeletal reconstruction (lower panel) and artist’s impression (upper panel) from the discoverer’s website, shows that the creature did walk but looked nothing like a whale (even though the discoverer believes it to be a whale, and also believes the wolf-like Pakicetus is a whale). (From The Thewissen Lab pages14). He offers three possible interpretations of the fossil record: Possibility 1—God created individual species; Possibility 2—God created prototypes which diversified into related genera and species over time; Possibility 3—God continuously creates by guiding and assisting the process of evolution. He is willfully unaware that no creationists today espouse the first of these so it is a ‘straw man’, and the third directly contradicts Genesis 2:3 where God finished His work of creation and rested—a theme repeated in the Sabbath commandment Exodus 20:11. He offers the usual fossil evidence for vertebrate evolution, but on the question of ‘Why can’t scientists find more transitional forms?’ (p. 125) he retreats into Darwin’s excuse—incompleteness of the fossil record. He conveniently overlooks its great completeness when it comes to finding extant creatures in the fossil record; the ‘evidence’ for incompleteness is the lack of intermediates! 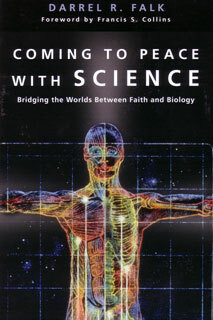 He then asks: ‘If creation occurs by gradual modifications (Possibility 3) why don’t we see it happening today?’ (p. 130). His solution is ‘God’s command and God’s Spirit working through an influence on natural processes down through eons of time’ (p.131–132). That is, supernatural processes—a fatal blow to the whole purpose of his book (see below). Biogeography, he says (Ch. 5), shows the same variation today in space that we see occurring back through time in the fossil record, and thus ‘our theology must not be based upon a view of God that prohibits this’ (p. 168). In his specialty area of genetics (Ch. 6) he argues that mutations, duplicated genes, pseudogenes, silenced virus insertions and retrotransposons allow us to trace genetic histories back across millions of years, millions of generations, and across genus, family and higher order taxonomic categories. ‘There is no “break” in the genetic data that implies that the human body was created in a manner that is different than the way in which God created other living creatures. The [human] fossil data is especially poignant [because intermediate forms appear in the right order at the right time]. … Adam and Eve would simply have been the first humans to experience what it really means to live in the image of God’ (pp. 224–226). At the end, he returns to his purpose, ‘to present the view of gradual creation … to show that it is not inconsistent with the foundations of the faith’ (p.229). He appeals for a downplaying of the alternative ‘sudden creation’ so that we might ‘not allow a particular interpretation of a tiny section of God’s precious Word to become so central that it creates a gulf blocking the access of any individuals to the experience of God’s love in the church [emphasis added]’ (p.234). There are so many fundamental errors, omissions and contradictions in this book it is hard to know where to start. I shall focus on four points that Falk emphasizes in his speaking ministry, then look at four contradictions that invalidate his main argument. The church made a terrible mistake with Galileo by wrongly interpreting the Bible to say the sun went round the earth. We should not try to make the Bible say things that it was never meant to say (Ch. 1). Falk has adopted a secular worldview and he changes the Bible to fit this worldview. This is an entirely reasonable argument to make in Galileo’s case. Indeed, nowhere does the Bible make a cosmological (i.e. at the grandest possible scale) statement about how the earth moves in relation to the sun. There are Earth-referenced descriptions of the sun rising and setting, of course. But we today still use the same language in our weather forecasting, e.g. ‘sunrise’ and ‘sunset’, so it is a non sequitur. On the other hand, the Bible contains numerous cosmological statements about the fact, the nature and the timing of God’s work of creation. God spoke the universe—heavens, earth, life, man—into existence (Genesis 1; Psalm 33:6, 9; 148:5; John 1:1–3; Hebrews 11:3), over a six ordinary-length-day period (Genesis 1; Exodus 20:11). Also, God wrote this down with His own finger in stone (Ex. 31:12–18; 32:16) to make sure the Israelites could not neglect it, and He instructed Moses to provide a written record (Exodus 34:27; Deut. 31:24–26) as a witness for all generations to come. Furthermore, the Galileo affair turned upon non-biblical issues, and was first of all an attack by the Aristotelian scientists on Galileo’s challenge to the reigning Ptolemaic cosmology.2 The apparent biblical conflict was with the post–Council-of-Trent Catholic Church, which had arrogated biblical interpretation to the constraints of church tradition by its own ordained priesthood. Today, both Falk and his opponents (YECs) enjoy the Protestant freedom of personal interpretation according to the grammatical-historical hermeneutic method (i.e. we interpret the books of Moses as Moses and his contemporaries would have interpreted them). When we do that, we are forced to conclude that Scripture really does intend to mean six-day recent creation. It is beyond challenge that the earth is billions of years old and not 6,000 years. All different lines of science agree—astronomy, geology, isotope dating—and we have to accept this (Ch. 3). Falk is ignorant of the presuppositional nature of all discussions on origins, and of the difference between data and interpretations of data. No one has a time machine to revisit the past and study it, so all our thinking about it has to be based upon assumptions. Those assumptions constitute our worldview—our fundamental belief about where the world came from and how it got to be the way it is. Isotopic ‘ages’ are not data—they are interpretations of data. The isotope ratio measurements are the data. Other interpretations of those ratios are possible, given different starting assumptions.3 Falk has adopted a secular worldview and he changes the Bible to fit this worldview. He is also ignorant of the limitations of science in regard to the past—that it works by observation and experiment and can thus only function in the present. No one has ever measured the age of the earth. Isotope daters only ever measure isotope ratios—they never measure age. Layer counters never measure age, they only count layers. Jesus’ death and resurrection ‘according to the scriptures’ (1 Cor. 15:3–4) is our guarantee that the Bible is authoritative when speaking about ‘earthly things’ so that we can be confident of its authority when it talks about heavenly things (John 3:12). There is therefore always room to look for alternative young-earth explanations of scientific data. To properly measure the age of the earth you would need to be there at the beginning to start your reliable timing device, and then you would need to keep a reliable record of all the time that has elapsed since then. No one has ever done this—except the God of the Bible, and He has given us an eyewitness account of what He did, when He did it, and how He did it, and wrote it down with His own finger in stone, as recorded in the Bible (Ex. 31:12–18; 32:16). It is beyond challenge that animals have evolved over millions of years. The fossils have a clear sequence. The early fossils are quite different from later fossils. The transitions are well documented (fish to land, turtle, whale, elephant). The transitions occur at the right time in the fossil record, therefore evolution is demonstrated fact (Ch. 4). Fossils do not unequivocally support evolution, as Darwin acknowledged. Arguments based on vertebrate remains are always equivocal, for the remains are always partial (usually just bones). For large groups like arthropods and plants where whole organisms are preserved—often in exquisite detail—no evolutionary series exist. As Gould said repeatedly, ‘paleontologists have always recognized … the central fact of the fossil record [to be] geologically abrupt origin and subsequent extended stasis of most species.’5 The overall fossil sequence is better explained in terms of baraminology,6 and Flood geology,7 than by universal ancestry over billions of years. Falk selects evidence to suit his argument, is ignorant of YEC critiques of his material,8 and so fails to critically assess the real issues. Falk claims the rarity of transitional fossils to be a victory for evolution by saying that geneticists predict that evolution occurs too quickly for the fossilizing process to catch it, so the few we have today prove this prediction to be correct (p.128). Yet in the very next section, entitled ‘If creation occurs by gradual modification why don’t we see it happening today’ (p.130), he argues that the answer lies in the immensity of time. A theory that predicts the evidence to support it will be absent is self-refuting. It is beyond challenge that humans have evolved from apes. Genetics shows that chimpanzee chromosomes 12 and 13 joined up to form human chromosome 2, and we can still see the join in the middle part where there are two telomeres and one centromere. The ‘data’ are an imperfectly matching set of chromosomes—none of several sequence comparisons provided a perfect match, so other chromosomes could have been involved or none at all. The pattern is unique to humans so it could have been created that way, and the fusion theory has difficulties (reduced fitness in the F1), so no one really knows. Given that there are about 125 million base pair differences between chimps and humans,10 and no one yet knows which the developmentally crucial ones are, Falk’s argument is nothing more than evolutionary speculation. Any similarities between ape and human chromosomes is no more remarkable than the fact that ape and human bodies are made up of the same kinds of molecules, and have a broadly similar shape. The real difference lies in how chromosomes are activated during embryonic development. But Falk does not even mention this crucial subject. The definitive information is missing, and Falk is either ignorant of the fact or has papered over it. Falk cites (on p. 144) parallel but independent development of cichlid fished in lakes Tanganyika and Malawi as proof of evolution. However, all it shows is similar assortment in varied combinations of the same characters from the same ancestral gene pool. (From Kocher et al.15). Had Falk read books like Henry Morris’ The Genesis Record or Jonathan Sarfati’s Refuting Compromise, he could never say that Genesis creation constitutes only a ‘tiny section’ of Scripture. Genesis creation and the Fall are foundational to Christ’s work of redemption, His resurrection, and the new creation—all the major doctrines of the Bible. To the objection that his views put death before sin, Falk answers Romans 5:12 and 1 Cor. 15:22 by saying it was only man who died, and then only spiritually. By this logic, the resurrection of the Last Adam would also have to be spiritual, rather than the bodily one that left the tomb empty—and the only sort of ‘resurrection’ that would be meaningful to a Jew. To the question of the impact of the Fall upon the rest of creation, he answers Romans 8:20–22 by saying that the Fall resulted in mankind’s sinful exploitation of the earth, which then resulted only secondarily in creation’s suffering. This ignores the cosmic scope of the last passage and its connection with the Fall.11 The absurd consequences of this view for eschatology are astounding. Falk’s new creation will feature God’s creatures doing what comes naturally, suffering and dying as they did before, but without the exploitation of fallen humans to bother them. And humans will live eternally in their resurrected spirits with God, but their bodies will continue to do what is natural and they will suffer and die as usual. Falk’s stated purpose—building a bridge between evangelical faith and science by providing a figurative interpretation of Genesis creation to fit the ‘data’ of long age evolution—goes nowhere. His ‘bridge’ does not reach the position of evangelical faith, because evangelical faith is in the word of God (Romans 10:17) as revealed by exegesis (not as reinterpreted by eisegesis). What Falk is actually doing—as opposed to what he is trying to do—is asking people to transfer their faith from the Bible to science. Nor does his bridge reach the side of ‘science’, with his talk of continuing supernatural interventions. If Falk really believes that what he writes is true, then he should come to the conclusion that his position on a figurative view of Genesis creation is the correct one and that the literal view is therefore incorrect. But he does not come to this conclusion. He concludes that ‘There needs to be room for both views in evangelical Christianity [emphasis added]’ (p.227). So all his protestations about ‘overwhelming evidence’ and ‘the data of science demand it’ do not lead him to any certainty for himself. How then can he provide any guidance for his readers? Obviously he cannot. Is Genesis poetry? and Who was the father of hermeneutics? See for example Origin of Life Q&A. Return to text. See Galileo, Geocentrism Questions and Answers. Return to text. See the RATE project reports, e.g. <www.icr.org/article/114/>, 26 September 2006. Also, De Young, D., Thousands not Billions, Master Books, Green Forest, AR, 2005. Return to text. See for example, De Young, D., Thousands not Billions, Master Books, Green Forest, AR, 2005; Williams, A.R. and Hartnett, J.G., Dismantling the Big Bang: God’s Universe Rediscovered, Master Books, AR, Ch. 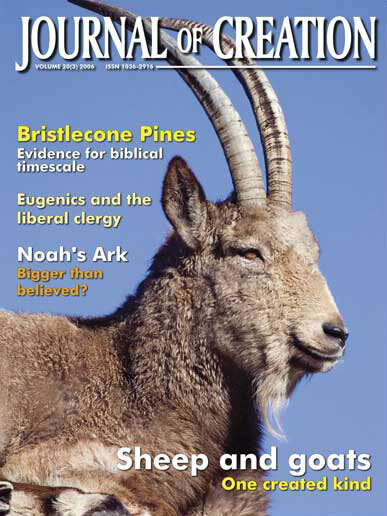 5, 2005; and numerous articles at ‘Young’ age of the Earth and Universe Q&A. Return to text. Gould, S.J., The Structure of Evolutionary Theory, Belknap Press, Harvard University Press, p. 749, 2002. Return to text. Wise, K.P., Baraminology and the Flood/post-Flood Boundary, Exploring the History of Life, Proceedings of the Fifth BSG Conference, 5 June 2006. Return to text. See for example, <www.biblicalgeology.net/>, 21 September 2006. Return to text. E.g. Sarfati, J., Refuting Evolution, Master Books, Green Forest, AR, 1999: ch. 3 on turtles and others, ch. 4 on on bird evolution, ch. 5 on whale evolution (available online); Tiktaalik—a fishy ‘missing link’, on fish to amphibians. Return to text. Fan,Y., Linardopoulou, E., Friedman, C., Williams, E. and Trask, B.J., Fusion site in 2q13-2q14.1 and paralogous regions on other human chromosomes, Genome Research 12:1651–1662, 2002. Return to text. DeWitt, D., Chimp genome sequence very different from man, Journal of Creation 19(3):4–5, 2005. Return to text. See Smith, H.B., Cosmic and universal death from Adam’s Fall: an exegesis of Romans 8:19–23a, Journal of Creation 21(1) (in press), 2007. Return to text. He notes in his Acknowledgments that a severe adverse reaction greeted release of an early draft of his book amongst his academic peers, but he does not say why. This may (or may not) be the reason. Return to text. Williams, A.R., a review of Stark, R., For the Glory of God: How Monotheism Led to Reformations, Science, Witch-hunts and the End of Slavery, Journal of Creation 18(2):49–52, 2003. See section ‘God’s handiwork: the religious origins of science’. Return to text. The Thewissen Lab pages. 22 September 2006. Return to text. Kocher et al., Similar morphologies of cichlid fish in Lakes Tanganyika and Malawi are due to convergence, Molecular Phylogenetics and Evolution 2(2):158–165, 1993. Return to text.